The lymphatic system is a widespread system of tissues and vessels. Its organs are not in continuous order, but are scattered throughout the body, and it services almost all regions. Only bone tissue, cartilage, epithelium and the central nervous system are not in direct communication with this system. * Fluid balance. As blood circulates through the capillaries in the tissues, water and dissolved substances are constantly exchanged between the bloodstream and the interstitial fluids that bathe the cells. Ideally, the volume of fluid that leaves the blood should be matched by the amount that returns to the blood. However, there is always a slight excess of fluid left behind in the tissues. In addition, some proteins escape from the blood capillaries and are left behind. This fluid and protein would accumulate in the tissues if not for a second drainage pathway through lymphatic vessels (Fig. 12-1). In addition to the blood-carrying capillaries, the tissues also contain microscopic lymphatic capillaries. These small vessels pick up excess fluid and protein left behind in the tissues (Fig. 12-2). The capillaries then drain into larger vessels, which eventually return these materials to the venous system near the heart. 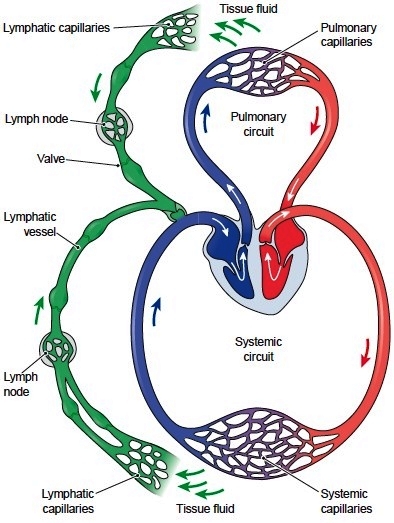 Figure 12-1 The lymphatic system in relation to the cardiovascular system. Lymphatic vessels pick up fluid in the tissues and return it to the blood in vessels near the heart. The fluid that circulates in the lymphatic system is called lymph, a clear fluid similar in composition to interstitial fluid. Although lymph is formed from the components of blood plasma, it differs from the plasma in that it has much less protein. * Protection from infection. The lymphatic system is an important component of the immune system, which fights infection. One group of white blood cells, the lymphocytes, can live and multiply in the lymphatic system, where they attack and destroy foreign organisms. Lymphoid tissue scattered throughout the body filters out pathogens, other foreign matter and cellular debris in body fluids. * Absorption of fats. Following the chemical and mechanical breakdown of food in the digestive tract, most nutrients are absorbed into the blood through intestinal capillaries. Many digested fats, however, are too large to enter the blood capillaries and are instead absorbed into lymphatic capillaries. These fats are added to the blood when lymph joins the bloodstream. Figure 12-2 Pathway of lymphatic drainage in the tissues. 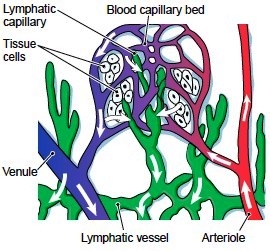 Lymphatic capillaries are more permeable than blood capillaries and can pick up fluid and proteins left in the tissues as blood leaves the capillary bed to travel back toward the heart.